Things are a little quiet in new pattern creation over on Flickr this week (although if you head on over to Sublime Stitching I notice they have a new free redwork pattern). So instead I thought I'd mention a new set of patterns from the 1886 Ingalls Pattern Book that have been cleaned up and reposted by Flickr user Jeninemd from patterns originally posted by the Embroiderist. Clicking on the link above will take you to the whole set but I particularly love this design of a spider web and roses. How strange! I was just thinking last night, "Maybe my next embroidery project will be a spider web." I keep getting them on my car in the mornings and they are so pretty but get wrecked by the time I'm on the road. 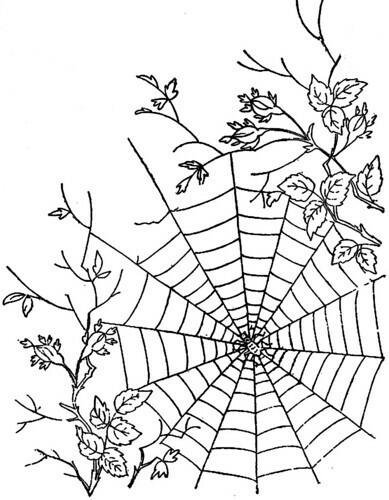 I don't know why but, I am surprised a spider web pattern would have been published in 1886. I needs to read up on this. Really a nice pattern. Thank you for sharing.